The Owls opened their Atlantic Ten Conference schedule with a 3-1 win over Charlotte and a sweep of George Washington. JOHN MEHLER TTN Junior outside hitter Yun Yi Zhang, redshirt freshman middle back Jasmine Waters and junior outside hitter Jovana Radojevic go up for a block against George Washington on Saturday, when the Owls swept the Colonials. The brooms were out in North Philadelphia this weekend, as the volleyball team started out the Atlantic Ten Conference season undefeated with a 3-1 win against the Charlotte 49ers and a 3-0 sweep of George Washington. Friday night’s victory against Charlotte opened up the A-10 portion of the schedule for the Owls. 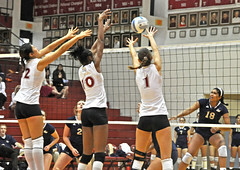 The 49ers couldn’t communicate as well as the tight Temple squad and fell 25-17, 26-24, 19-25 and 25-22. Junior offensive powerhouse Yun Yi Zhang picked up another 23 kills and kept her lead in the NCAA on kills-per-set. Her effort wasn’t un-assisted though, as senior captain Jackie Morrison recorded a double-double with a resounding 42 assists and 12 digs. Junior outside hitter Cayleigh Ashman also had a season-high 10 kills. Charlotte looked flat the whole game until pushed to the brink. The third set proved the 49ers wouldn’t go down without a fight. 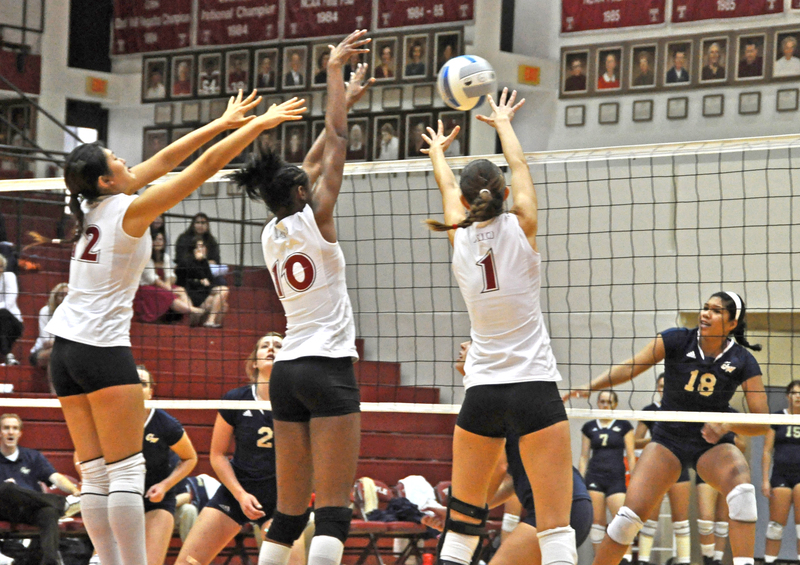 Coach Bob Bertucci credited strong blocking and minimal errors to Charlotte’s lone set. Even though Charlotte took a set from the Owls, the sweep of George Washington proved the tougher matchup, as Temple won by scores of 25-23, 26-24 and 25-23. All three games were closely contested, as both GW and Temple traded points in every game. The biggest lead by any team at any time was just four points. Junior outside hitter Jovana Radojevic had four kills, and junior Jessica Antosz had four of her own. Those two, along with Morrison, showed strong defense up front all game, making key blocks during tight points throughout the match. Morrison was noted for her big defense, as she saved two long rallies with diving digs. Bertucci said the problems seemed to come from errors. The Owls committed 16 errors throughout the three games. Luckily for Temple, GW made 23 errors, which ultimately led to their 3-0 demise. To keep the flow going in the A-10, the next step for the Owls will be road tests against Dayton and Xavier before returning to Philadelphia to play La Salle. The Owls will participate in four out-of-conference tournaments before their American Athletic Conference schedule begins in September. Caroline Grattan has helped the Owls get off to a hot start.